Based on the exciting classic board game of Monopoly. With lots of prizes, bonuses and even a “Get out of jail” feature you’re bound to run into some cash and fun! Get to play the Monopoly game on the real Monopoly board. Win prizes and avoid getting into ‘Jail’. Select your bet by clicking on the -/+ buttons in the ‘Line Bet’ field and decide how many lines you would like to play with by clicking on -/+ buttons in the ‘Lines’ field. Click ‘Play’ to begin and click ‘Max Bet’ to select all lines and play. • This video slot has 9 paylines. 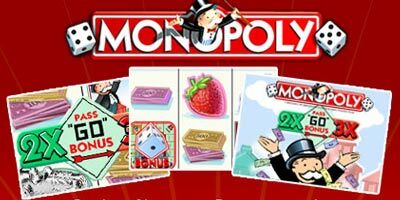 • 5 Monopoly symbols on an active payline multiply your bet by 2,000. • Wild symbol substitutes for all except for Bonus and Instant Bonus symbols. • Land on ‘Free Parking’ to collect random award. • Land on “Go” to win a 2X multiplier. • 3 Instant Bonus symbols anywhere on the reels earn the community chest an Instant Bonus. • Winning combinations pay from left to right. • Payline wins are multiplied by the amount bet per line. At the end of the Pass “Go” bonus game you will earn your bet per line multiple the sum of all of the awards that you accumulated, times the total of any Bonus Multipliers you earned. You should click one of the animating Instant Bonus symbols to reveal the Bonus Multiplier! o Get the Instant Bonus symbol in any position on the last three reels and earn the Community Chest Instant Bonus. o Click one of the animating Instant Bonus symbols to reveal your Bonus Multiplier. o Your Instant Bonus award is calculated by multiplying your total bet times the multiplier value that you revealed. o Earn the Pass 'Go' Bonus by getting three Bonus Dice symbols on a payline on which you have bet. o When you trigger the Pass 'Go' Bonus, select one of the three animating Bonus Dice symbols to determine how many times you may roll the dice in the bonus round. o Each Bonus Dice symbol reveals a different number of dice rolls, ranging from 1 to 6.
o After the number of rolls is revealed, you go to the Monopoly Bonus board, where you roll the dice to collect bonus winnings. o Once you arrive at the Monopoly Bonus board, click 'Roll' to roll the dice. o Your game piece will move along the Monopoly board in a clockwise direction the same number of spots as the sum of your dice roll. o The small numbered dice symbols that appear on the spots indicate what dice value is needed to reach that spot. o For your first roll in the bonus, your game piece starts off the board, so your first step is onto the 'Go' spot. o You start the bonus with an award of 10.
o Each time your game piece lands on a deed, you add the award value associated with the deed to your award. o When you round the board and pass 'Go', the deed awards on the board grow. o The first time you pass 'Go', the deed awards are doubled. After passing 'Go' twice or more, the deed awards are tripled. o If your game piece lands on Chance, your game piece will advance to another spot on the board, selected completely at random. o If your game piece stops on the Free Parking spot, you will be all the richer for it. o The parking meter will randomly select an award value and it will be added to your award. o In addition to the awards that you accumulate, there are two special spots, 'Go' and 'Jail', that can earn you even more cash! If you land on 'Go', you earn a 2x Bonus Multiplier, which multiplies your entire bonus total. o If you land in Jail, you are taken to the Jail Bonus, where you can earn a Bonus Multiplier if you roll doubles within three tries. o The sooner you roll doubles (both die values the same), the larger your Bonus Multiplier. o You have three chances: if you roll doubles on the first roll you earn a 5x multiplier, if you roll doubles on the second roll you earn a 3x multiplier, and if you roll doubles on your last roll you earn a 2x multiplier. o If you do not roll doubles within 3 tries, the Jail Bonus ends without adding a Bonus Multiplier. If you land on either Go or Jail more than once and earn a bonus, your Bonus Multipliers are added together. o At the end of your bonus round, your Total Bonus Award is calculated by multiplying the bet on the payline that triggered the bonus times the sum of all of the awards that you accumulated, times the total of any Bonus Multipliers you earned. 888casino: claim your free spins, no deposit bonus or welcome package here! 888games: claim your free spins, no deposit bonus or welcome package here! Bet365: claim your free spins, no deposit bonus or welcome package here! Betfair: claim your free spins, no deposit bonus or welcome package here! Betfred: claim your free spins, no deposit bonus or welcome package here! Betsson: claim your free spins, no deposit bonus or welcome package here! Betvictor: claim your free spins, no deposit bonus or welcome package here! Coral: claim your free spins, no deposit bonus or welcome package here! Jetbull: claim your free spins, no deposit bonus or welcome package here! Ladbrokes: claim your free spins, no deposit bonus or welcome package here! Mr Green: claim your free spins, no deposit bonus or welcome package here! Netbet: claim your free spins, no deposit bonus or welcome package here! Paddypower: claim your free spins, no deposit bonus or welcome package here! Redbet: claim your free spins, no deposit bonus or welcome package here! Skyvegas: claim your free spins, no deposit bonus or welcome package here! Stanjames: claim your free spins, no deposit bonus or welcome package here! Unibet: claim your free spins, no deposit bonus or welcome package here! Verajohn: claim your free spins, no deposit bonus or welcome package here! William Hill: claim your free spins, no deposit bonus or welcome package here! "Monopoly * How to Play * 5 Pound free"